“Oh yes, I love the Uber app too!”, he said. 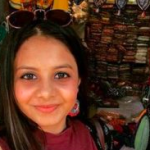 Instantly, our mutual appreciation for the app became a kick-starter for the hour-long conversation that I had with a traveler I was sharing the Uber cab with. Later that day, I sat down contemplating and researching, and rounded up “8 Prerequisites (and Takeaways) to Remember for Highly-Personalized E-Commerce Marketing”. 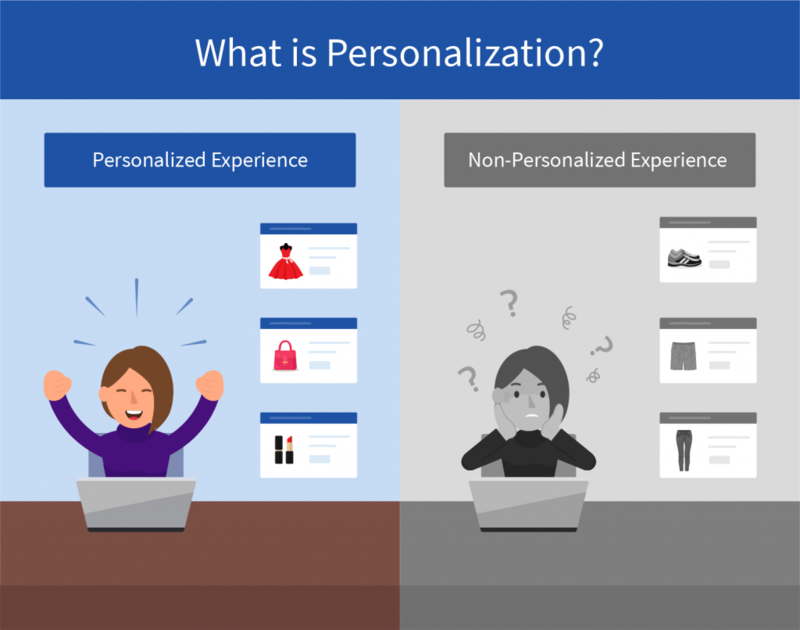 Before we get to that, let’s first understand what personalization isn’t? Simply put, personalization is giving customers a highly nuanced, individualized and consistent experience during every interaction they have with your brand, across all channels. And NOT annoying them with irrelevant, unnecessary content. 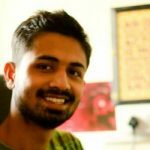 Why e-commerce brands must do personalized marketing? Because the new breed of consumers is empowered by mobile, consumers can get exactly what they want, instantly and effortlessly. As a result, they are more curious, demanding, and impatient than ever before. For marketers, this means these consumers are also tougher to reach and please. A brand’s ability to leverage data to anticipate their needs will define its ability to grow – Google explains. 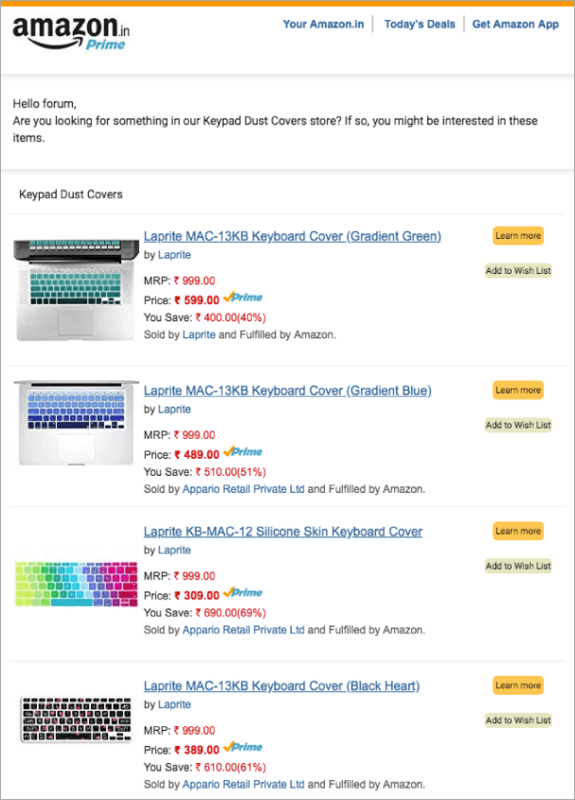 Have you ever come across Alibaba.com or Amazon.com littering a list of products, you never thought of buying, when you go to their websites? Never, right? They show only those products which YOU, as a customer, are most likely to buy. They know that unnecessary information without any personalization will only plummet their conversions. In fact, Google also states that products worth a total value of over $280 billion are abandoned in digital shopping carts, every year. No, or very little personalization is definitely a reason as Marketing Dive found that businesses have annually lost $756bn because of poor personalization. IBM reports that 62% of marketers experience a strong competitive advantage with the use of data. It has a reason. You can get information about EVERY user, whether identified or anonymous, in some form. If the user has registered with your brand, you can collect user details like – name, age, location, birth date, and gender to name a few. If the user is anonymous, meaning s/he has not registered with your brand, you can still have information (like their IP address, location, interest based on the URLs they visited) which can be used for further engagement. A nice way to know your unknown visitor would be to offer them some discount and ask them to share their email id and gender in return. 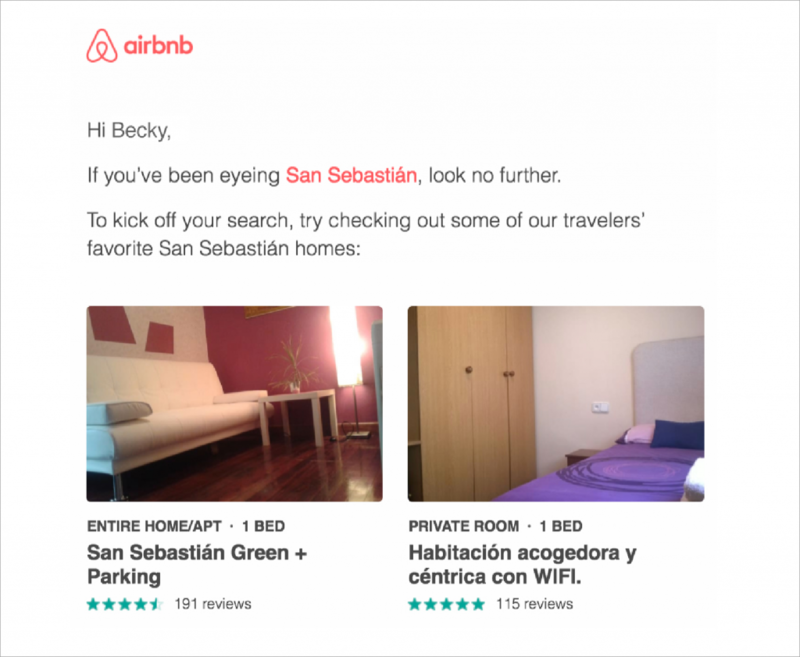 When Airbnb released a new update to its app in 2016, it announced it saying, “The newly updated Airbnb mobile app has personalization at its heart.” The app monitors the user’s trips, traveling preferences and plans, and uses that information to offer the utmost personalized experience. Reports confirm 83% of consumers are willing to share their data to enable a personalized experience. Takeaway: The more data you get from your consumers, the more tailored your customer experiences can be. Research states that eighty-one percent of consumers want brands to understand them better and know when not to approach them. Westside’s marketing is a classic example: The brand sent a highly-contextual email based on my recent purchase of footwear from their store. Which was quite convincing. Takeaway: Customers resonate with contextual content. There’s a wealth of consumer data on tap to help you do it. If you find out your customer’s intentions and motivations you would know what to offer him next. A survey by Accenture reports that 91% of consumers are more likely to shop with brands who recognize, remember and provide relevant offers and recommendations. Predictive personalization is the way forward. 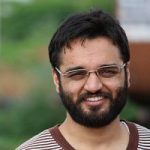 Making use of it helps you in understanding what a customer expects at different stages of the lifecycle. If you are an on-demand beauty services brand, you definitely wouldn’t want to send an email about new products to someone who has only visited your website and not made a purchase yet. You’d rather send them some intriguing information and deals about signing-up with your brand. Likewise, if you’re a travel brand you’d want to share information about specific flights to your travelers who frequent book flight tickets on your app/website. Takeaway: Being able to predict the intent of your customer’s next, future purchase helps in knowing who to target with what. Building customer lifetime value is vital. A Statista report predicts: the number of smartphone users will hit around 2.5 billion in 2019. While this is true, it is also evident that modern consumers are accessing information on a number of devices (laptop, tablets, phones, etc. 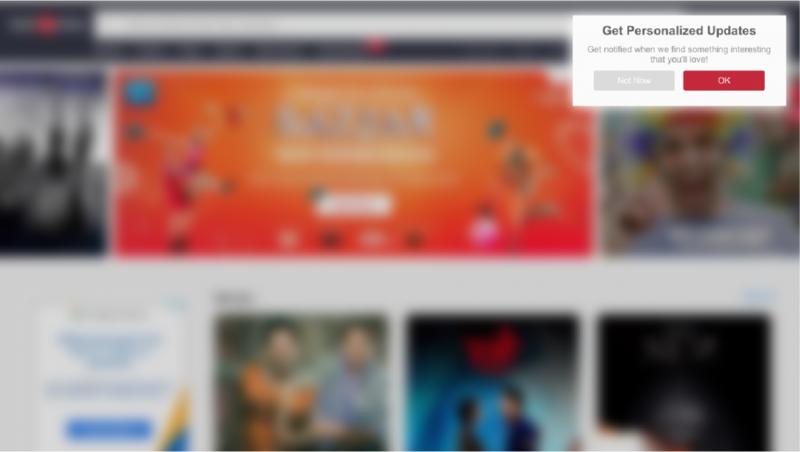 ).This multi-screen behavior calls for e-commerce websites to optimize their communication for different devices. Digging into your user’s past behavior and activities like time spent on the website, mobile app usage, products browsed, the frequency of buying and so on helps in finding out which device was most preferred for all of these activities. Takeaway: Finding out the most preferred device a customer uses and clubbing it with user’s historic data, helps in tailoring impactful device-friendly campaigns. Research says, over 51% of consumers shop on multiple devices and channels – email, SMS, web, push, ads, offline, etc. So it is equally important to find out which channel is the customer most interactive on at a particular stage of the lifecycle. Consumers may look for something online and then head into the store to make the purchase. Or, they may be at a brick-and-mortar store, see a product they like but isn’t available in their preferred color, and then pull out a tablet to check the inventory and make the purchase. Multiple scenarios like this exist but the most important aspect is that if each of these channels is interconnected, you can provide an omnichannel experience – a seamless experience and connected purchase journey for your customers. BigCommerce’s Omnichannel Retail report shows that online spending is distributed evenly between marketplaces, large retailers, web, and category-specific stores. The omnichannel approach focuses on the customer and ensures that each customer can easily and seamlessly navigate between every touchpoint to make a single purchase. Sending campaigns to appropriate channels will not only bring higher engagement but also increase your customer’s affinity towards your brand. Alibaba is acing the omnichannel experience game and expanding its services in multiple countries. Takeaway: Talking to customers where they’re most likely to talk to you, gives roots to a two-way conversation between them and you. Do you know where your customers are? Which country, region, town, etc. Unlike physical borders between countries, the digital world is free of boundaries. Your customer could be chilling on an island and ordering things for his family back in Canada. 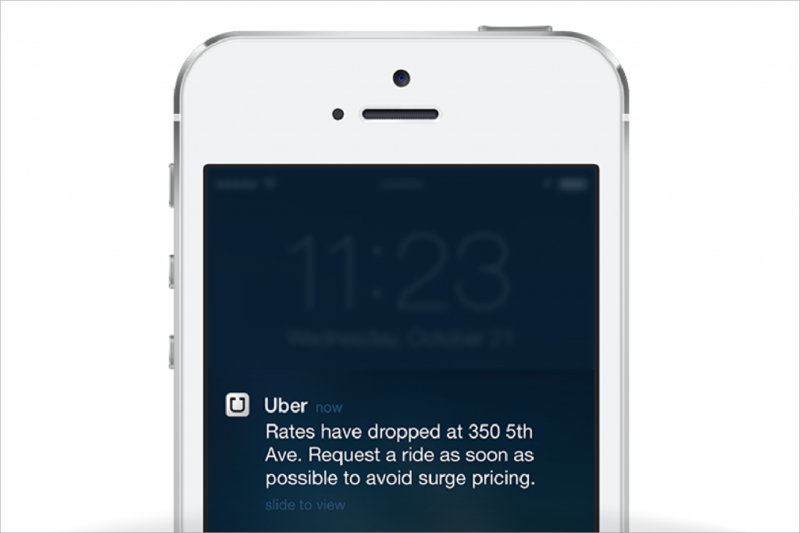 Think of the SMS or push notification that Uber sends to you when you enter a certain area. By analyzing historical location data and detailed behavioral patterns, you can gain comprehensive insights into consumer preferences and habits which can be used for location-specific deals. A simple step to kickstart location-specific personalization could be identifying your new user’s location and directing them to the most appropriate page (like 3M does!). Another classic example is Starbucks: It successfully keeps customers engaged with its gamified mobile app. Integrating the brand’s rewards system with the ability to customize and order drinks via the app, it makes use of information such as purchase history and location to get as personal as possible. The introduction of the rewards system saw Starbucks’ revenue soaring to $2.56 billion, while the app has generated around 6 million sales per month. Takeaway: Audience- profiling based on location enables creating segments of lookalike consumers to expand a brand’s reach in a highly targeted manner. Geo-targeting can improve marketing ROI by taking advantage of regional trends. Only 50% of businesses are differentiating their marketing according to demographics, says the marketing maestro Neil Patel. 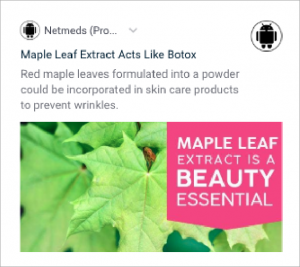 Netmeds, an online medical store, sends targeted push messages specific to common issues faced by people of a certain age in a particular area. Takeaway: Cleverly aligning customer demographics with their past behavior and data empowers you to drive improved responses and conversions. The latest report on “The 2018 State of Marketing Automation” cites over 85% of businesses rating marketing automation systems as most effective for targeted and seamless personalization. Marketing automation creates a cloud-based platform to collect, collate and understand your customer’s data from across an array of mediums and channels. It further helps you organize your customers based on their different buying patterns allowing you to craft extremely personalized omnichannel campaigns and experiences – purely based on user’s information like the demographics, reachable channels and devices, correct time, geography, and so on. 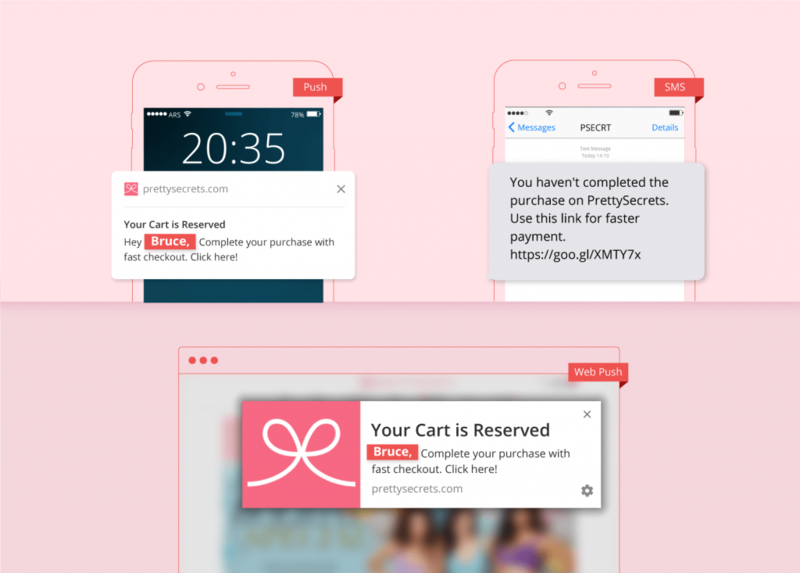 Pretty Secrets, an online lingerie brand, uses marketing automation for powering their cross-channel personalization. 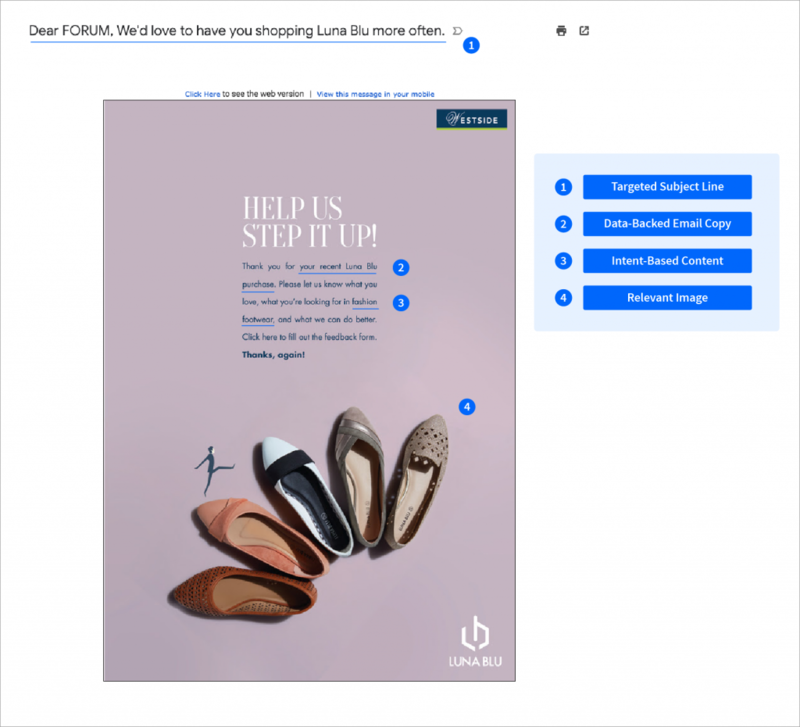 Check out some examples of B2C brands that totally nailed personalization using marketing automation. Takeaway: Building accurate, data-driven personas and automating your communication based on buying personas helps in smart, meaningful and most effective personalized customer experiences. Finally, are you one of the 89% of digital businesses that are investing in personalization? Companies like JD.com, Fabletics, Sephora, and Wells Fargo belong to the list. 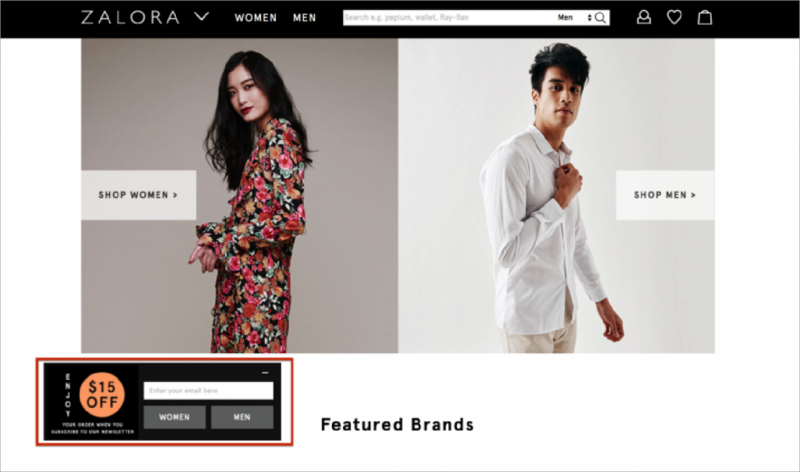 If you’re not using e-commerce personalization, you’re definitely losing revenue. But if you get it right, you can make huge gains. 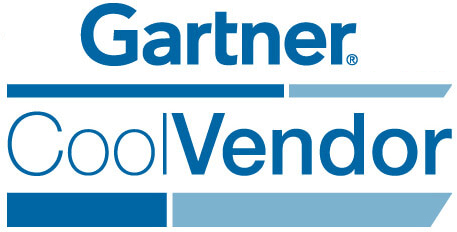 Gartner predicts a 15% profit boost by 2020 for those who successfully handle personalization in eCommerce. Now, look at the extent of personalization that you did in all of those. Did you do it right? Was everything that your customer received, meaningful and relatable? Did you connect with your customers on an emotional level? If you didn’t do it right, you now have a list of things (that you just read through!). Action them all for your next campaigns and surprise yourself with a roaring success! Do tell us about your experiences (both with your customers and fellow travelers!) in the comment section below. If you do, we’d certainly love to talk about it.